Based on the musical play by Chikamatsu Monzaemon, The Crucified Lovers is the story of a wealthy man who accuses his wife and an employee of having an affair as the two run away together. 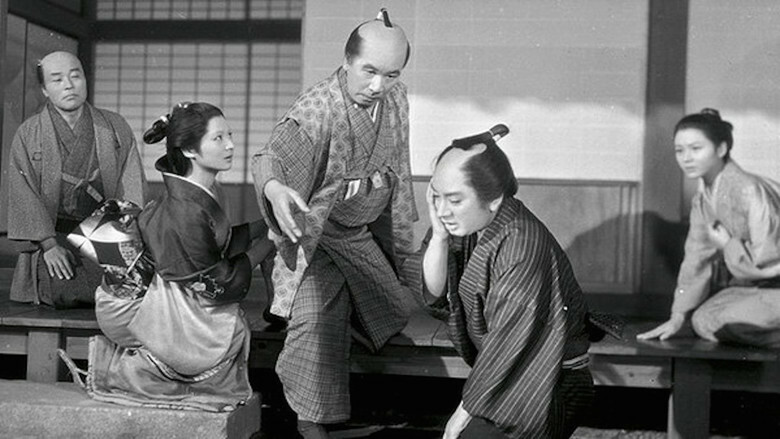 Directed by Kenji Mizoguchi and screenplay by Matsutaro Kawaguchi and Yoshikata Yoda, the film is an exploration of jealousy and neglect set in 17th Century Kyoto. Starring Kazuo Hasegawa, Kyoko Kagawa, Yoko Minamida, and Eitaro Shindo. The Crucified Lovers is a compelling and gripping film from Kenji Mizoguchi. The film revolves around a wealthy but selfish scroll maker who would accuse his wife and his top employee of having an affair when the reality is that the wife needed money to pay her brother’s debts which the husband refuses to do as she turns to his top apprentice for help. It’s a film that is about a man who drives away his wife and his top man into chaos all because he doesn’t want to spend the money he makes and have it wasted on things he thinks are mindless. The film’s screenplay is quite simple as it explores a man’s greed and his unwillingness to help people as he would treat his wife cruelly as well as those who work for him as he would often try to engage into an affair with a young maid who has feelings for the top apprentice. The first half is about the trouble the wife in Osan (Kyoko Kagawa) would unfortunately create while the second half is about her and the apprentice Mohei (Kazuo Hasegawa) running away as they deal with what to do next as they’re being pursued by people working for Osan’s husband Ishun (Eitaro Shindo) who wants to deal with them himself rather than report them to the authorities. Kenji Mizoguchi’s direction is definitely engaging for the way he captures life in 17th Century feudal-Japan where it’s run by warlords and such as there’s people willing to profit from these conflicts. Much of the film is shot in countryside locations in Japan as it plays into a world that is thriving yet there are rules that are quite cruel. Mizoguchi’s usage of the wide shots would capture this sense of oppression where there is a scene of a couple that is being shamed publicly and later crucified because they committed adultery which adds a sense of dramatic weight into the film. 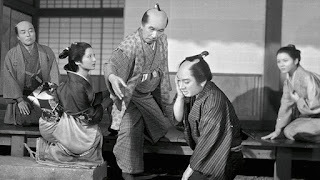 Yet, Mizoguchi would favor more intimate shots such as close-ups and medium shots to play into the drama which include these scenes at these lavish yet traditional Japanese homes as well in the forest where he would create a sense of theatricality into the acting as well as raise the stakes into what Osan and Mohei would endure. Especially in the third act as it play into not just the selfishness of Ishun finally catching up with him but the effects it would play into Osan and Mohei’s lives. Overall, Mizoguchi creates a riveting and haunting film about a wealthy man’s selfishness as he drives his wife and top apprentice into an affair. Cinematographer Kazuo Miyagawa does brilliant work with the film’s black-and-white photography for its usage of lights for many of the interior/exterior scenes set at night while going for something more natural in the daytime scenes. Editor Kanji Sugawara does excellent work with the editing as it is straightforward to play into the build of the dramatic intensity as well as in some of the moments of dramatic suspense. Production designer Hisakazu Tsuji, with set decorator Yaichi Ebise and art director Hiroshi Mizutani, does fantastic work with the look of the home of Ishun as well as his shop where he runs his scroll making business as well as some of the interior gardens. Costume designer Natsu Ito does wonderful work with the costumes from the design of the robes and clothes that the men and women wore in those times. The sound work of Iwao Otani is terrific for its natural approach to the sound as it help create some tension in the drama. The film’s music by Fumio Hayasaka and Tamezo Mochizuki is amazing for its unsettling yet enchanting score as its usage of percussions and string instruments help add weight to the drama as it is a major highlight of the film. The film’s superb cast feature a few notable small roles from Haruo Tanaka as Osan’s brother, Yoko Minamida as the maid Otama who is in love with Mohei, and Eitaro Ozawa as the scroll maker manager Sukeemon as a man who would try to defuse the situation only to cause more trouble. Eitaro Shindo is excellent as Ishun as a wealthy owner of a scroll making business who is a man that is very selfish as he neglects his wife and is indifferent about the feeling of his workers as he would plot a way to deal with his wife and Mohei. Kazuo Hasegawa is brilliant as Mohei as a scroll-making apprentice who is good at his job until he is asked to help Osan into giving her money where everything goes wrong as he deals with his growing disdain towards Ishun and his feelings for Osan. Finally, there’s Kyoko Kagawa in an amazing performance as Osan as Ishun’s wife who is trying to help her family as she puts herself and Mohei into a terrible situation as she becomes angry over her husband’s insensitivity as she would try and make a life of her own only to realize how difficult it is. The Crucified Lovers is a marvelous film from Kenji Mizoguchi. Featuring a great cast, gorgeous visuals, a captivating script, and an eerie music score. It’s a film that explores Japanese society where everything is unruly during its feudal times as well as a woman dealing with the selfishness of her husband and the help of another man. In the end, The Crucified Lovers is a remarkable film from Kenji Mizoguchi.